If you are an eLearning professional, this is a post full of valuable information you'll want to save. We’ve listed 35 amazing eLearning tips that can significantly improve your training. Some are simple, some are a little more ambitious, and but each one will help you create a more successful eLearning strategy for your organization. Let’s start with what needs to be central to your eLearning program - your goal. When creating an eLearning program, it’s easy to get stuck focusing on that single course; however, it's important for organizations to have an overall goal for their eLearning. Knowing your overall goal will not only empower you to have a direction for your eLearning, it also gives you the ability to measure if your efforts are working, thus saving you time and money in the long run. From delivering yearly compliance training to 10,000 employees or onboarding new hires in under 4 weeks - whatever your goal may be, ensure you know what it is before starting your training. There is a myriad of project management online tools that allow you to keep track of assignments and collaborate with your eLearning team. Best of all, they can be accessed anywhere, anytime, which means that you can improve your productivity. Some of our favorites are Trello, Asana, and Wrike. You also don’t have to worry about losing important documents, as you can add them to tasks and everything is stored in the cloud. Just make sure that you choose a project management tool that’s right for your needs and take full advantage of its features. When planning online training, there can be a lot of people involved. It’s essential that you know who is included, their role and how they will impact your businesses eLearning strategy. Listing out each of these will help you to organize how you create, implement and sign-off on courses, ensure effective feedback and streamline your overall strategy. Additionally, you should also include your customer success team that you are working with through your learning management system (LMS) as they are sure to be involved in your eLearning success. Your content ideas: Brainstorm ideas that should be included in your courses. Identify how they help your learners achieve their goals and how they fit into your eLearning strategy. It’s also a smart idea to identify who is creating your course content and whether it’s being delivered through video, images, or just text. Once developed, add these ideas to your project management tool as a handy and effective way to keep track of your tasks. You can also assign course ideas to different members of your team making your content plan much simpler to manage. Ensure you’re organized, meeting targets and delivering efficient training by creating a detailed schedule. Having an overall schedule will streamline your course creation, prioritize tasks, and enable you to create achievable to-do lists for all training stakeholders. Your eLearning schedule should include significant dates for your projects - start, end and other events. Add key dates for designers, managers and course creators so that you're all on the same page and can meet your deadlines. A good eLearning course isn't just about providing information for your learners. Instead, it motivates them. Motivation in eLearning can be achieved by identifying why your learners are taking your courses and tailoring your content to these needs. It can come in many forms - maybe they're learning a new software to solve a problem, maybe they're a new hire trying to get to grips with company policies, maybe they're trying to complete their compliance training so they don't have to think about it again for another year! Whatever the reason, discover what their motivation is and build courses towards answering their motivation. It will have a huge effect on your learner's completion rates. There are lots of ways to use motivation in your eLearning. For example, in your course description and objectives, you can clearly outline how completing this course will solve a learner's problem. Having an overall goal for your organization's online training is smart, but you should have a goal for each module you develop too. Too many learning goals in a single module can be overwhelming and potentially counterproductive. For each module, there should be a single, simple goal that your learner knows they will achieve by completing the module. This makes your training straightforward and maximizes the potential of your learner retaining information about the subject. 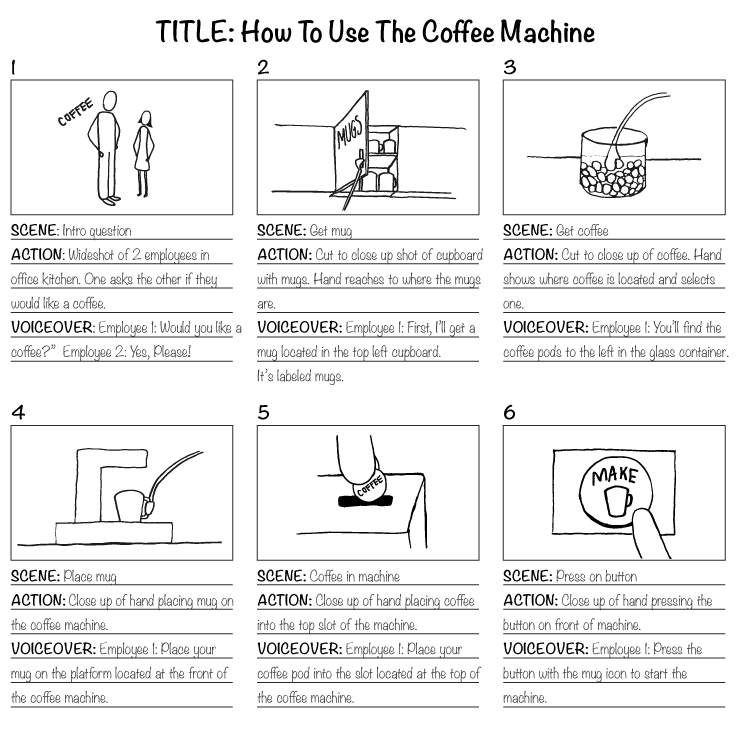 Storyboards are a great way to make your eLearning ideas visual! They’re described as a graphic organizer made up of a collection of images shown in a sequence that outlines the story you want to tell. You can use them to plan out videos, slides and more to see how your courses will work shot by shot. What makes storyboards so beneficial is that they can help you share your vision with others, add a focus and save you time in the long run. When creating eLearning courses, a lot of effort is placed into creating great course content. However, don’t forget about the course title. The course title gives your learner a taster of what to expect, therefore it’s vital you make it enticing and educational. In an effort to engage learners, we can all be guilty of throwing everything but the kitchen sink into courses! But this isn’t always the best choice. Too much media can be confusing and overwhelm a learner. Try using only one or two pieces of powerful media per module - a video, short text or slides. Keep the image numbers down too as you don’t want to distract your learners from your key message. There are TONS of studies about how long the average person's attention span is. Some say 10 minutes, others suggest 20 minutes and some say 8 seconds! Whatever the exact number, it’s clear that short, easily digestible training is best. To ensure you have the perfect course length experimentation is key. Test micro-learning (5-6 mins) courses against 20-minute courses and see how your learners respond so that you can find the timing sweet spot. Empower your managers, course creators and learners to train on the go by optimizing your courses for mobile. Optimizing for mobile means having a responsive design. This ensures your content is resized and adapted to the screen being used so that everything is clear and visible to your learners. There are lots of authoring tools that can help with creating mobile-friendly courses - Adobe Captivate 9, Articulate 360 and Elucidat to name a few. You can also use LearnUpon on any device without sacrificing visual or functional quality. Grab your learners attention with eye-catching banners. Displayed on your 'My Courses' tab in LearnUpon, think of them as mini billboards. Banners can be used to display images, video, gifs, or text and can be set to display the courses you have on offer. A handy call to action button can also be added so your learners can see an interesting course, click through to it and enroll easily. Motivate your learners by adding gamification mechanics to courses. Gamification can be achieved in a number of ways including points, badges, levels, and leaderboards. It can be used when a learner is tasked with completing courses to make the process more engaging and fun for learners. It can also give learners a nice sense of momentum through achievement and promotes a little healthy competition. With a choice of gamification features, it's up to you to decide how to use them in your courses. You can experiment with badges, points, and levels to make content more interesting. 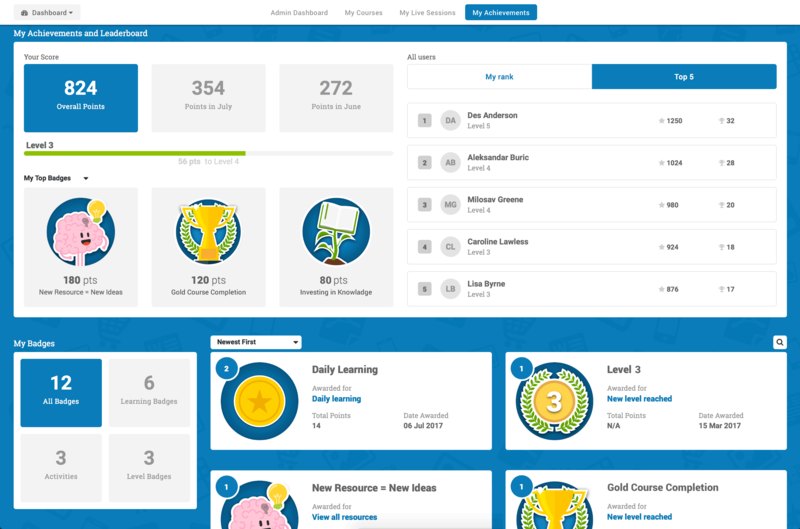 Or if you are struggling to get your learners to regularly log into your LMS, why not have a daily login badge? It's up to you! Different topics can be designed to match your company's style too! One fun example in LearnUpon is for a course on botany, there was a different badge for each plant. This was a great motivator as the learner could see very clearly the learning goals they have achieved.Pretty cool, huh? Blended learning is a model that can have a positive effect on your organization's training. Simply put, blended learning describes the combination of traditional, face-to-face learning with technology-based eLearning. You can mix it into your eLearning strategy handily by offering multimedia content to learners in between and during classroom sessions, you can carry out online assignments, use post-course questionnaires - whatever you like. It's all up to your organization and how it best works for you. Reward your learners for completing courses with certificates. These can be set up to generate automatically when a course is done. They can also be used for compliance training that may need to be renewed on an annual or semi-regular basis. Certificates have similar benefits to gamification, adding fun, a sense of achievement and motivation for your learners. And with LearnUpon, you can use our customizable templates to make them your own! Boost your learner's engagement with real-life incentives. For employees, it can be a little incentive such as being named 'learner of the month' or for customers, they could get a discount. It's a small, yet effective tip that can have a powerful impact on your course completion rates. One of the best ways to improve your course content is through feedback. This can be done a few ways, but one of our favorites is reviews. In LearnUpon, after a course is completed your learner can be prompted to give a star rating and a summary of what they thought. These reviews can offer invaluable insights into what was successful, where learners struggled and can improve how you create courses in the future. When a learner is added to your LMS or enrolled in a course, they'll receive a triggered email. This email should inform, motivate, and encourage your learner to take their course - it has to be good! With LearnUpon, portal email templates can be easily edited so you can make them as clickable as possible. Remember to add a short, clear subject line, make it personal by using their name, keep it short, mention the benefits training has for them and have a killer CTA. One of the best ways to save time when setting up courses in your LMS is automatic enrollments. In LearnUpon, this can be done in a couple of different ways. You can automatically enroll large numbers of users using group enrollment or you can connect to your HR system or member database via API so that when you have a new hire or member in your organization, they’re automatically added to your LMS and enrolled in relevant courses. They’ll receive an invitation to log in and they’re enrolled. Simple! Keep your learnings on the right track with learning paths. Defined as a selection of courses tied together for learners to progress through, mastering a particular subject or program, they are perfect for adding structure to your eLearning. They give you the ability to control when courses get assigned and the timeframe in which courses become available. Amazingly, learning paths can be set up in advance, so there is little administration time wasted. Which means your learners are self-sufficient in reaching their overall goal. If you've multiple audiences to train, do it all through one handy account with portals. 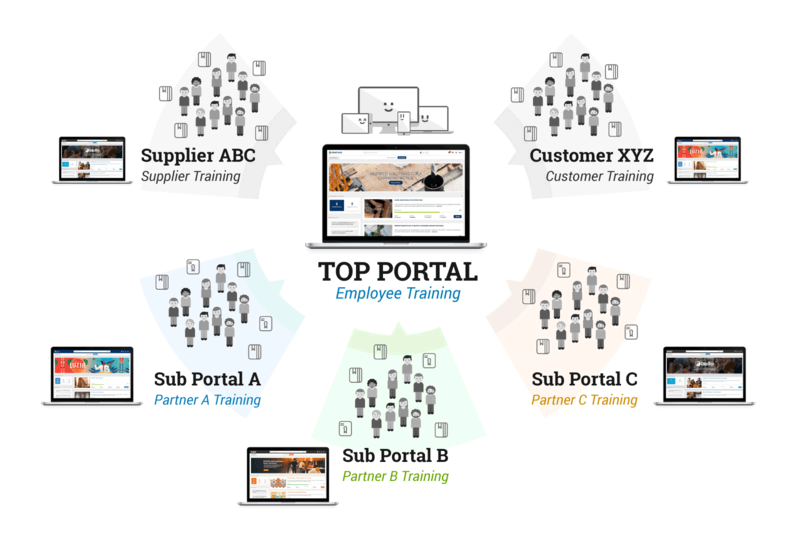 Through LearnUpon you can create individual portals for each group you need to train. Each portal can have their own unique URL as well as branding just for them. Portals are incredibly efficient as you can duplicate the settings of each portal making them extremely scaleable. Even better, you can delegate the administration of every portal, meaning there is no need for micromanaging and you have more time to get on with other tasks. Create a seamless brand experience for your internal and external learners by branding and white-labeling your LMS. Branding allows you to add your own logos, colors, banner images and unique look to your LMS so that your learner has a familiar environment where they can take their courses. Additionally, with white-labeling, you can give your portal it’s own unique URL and removes the name of the software provider so your LMS truly feels like a part of your organization. Boost your online training by empowering your manager and supervisor employees to become involved. By encouraging senior employees to play an active role in your LMS, it creates a better learning culture in your organization and shares invaluable knowledge among employees that helps them upskill. Continuously rolling out similar courses with the same media becomes monotonous for learners. It can reduce their engagement and leave them unenthusiastic about online training. Ensure interest by using a variety of courses to keep them on their toes. From video learning to live training sessions to slides, mixing up the media you use can dramatically improve your learner's engagement and retention levels. The data you can get from your reports in your LMS is invaluable - use it! It can provide you with a wide variety of insights that not only improve your online training but impact your organization as a whole. Reports can easily track course progress, exam performance, training histories and more so that you can continuously improve your training. It can also give you insight into the return on investment your organization is getting from administering training online. Storytelling is clever as it goes beyond just sharing simple information. It makes training much more interactive and gives your audience something memorable. Remember though, keep your core message in mind. Your story should enhance your message, not overshadow it. The first few seconds of your courses need to grab your learners attention. If it doesn’t, you run the risk of your learner losing interest. There are some tactics that you can implement to create a powerful opening that sparks curiosity. Short explainer videos are really effective as they grab attention and demonstrate what's to come. You can also present the problem that the course will solve with snappy text or images to give users a clear indication of how they will reach their goal. An effective technique to test and improve your learner's skills is to stimulate their prior knowledge. It's a simple yet potent way to get learners to remember what they've learned and help them realize the real world implications that courses can have for them. Get in-depth information about what your learners are thinking with surveys. After a learner has completed a training course, administer a survey as it’s the perfect time to get actionable and insightful feedback. You can add survey’s to your courses in LearnUpon easily. Add different questions such as multiple choice, ratings, and long-form answers and get valuable feedback that can improve your training. Get the reports you need from your LMS by configuring them to meet your requirements by using custom filters. These reports can be viewed on screen or export them to Excel or PDF and even be automated to save you time. With LearnUpon, you can schedule daily, weekly, or monthly reports. These can then be sent automatically to anyone in your organization and you can decide who they’re sent to - even if they're not LearnUpon users! This means you are always up-to-date with your learner's progress and getting the vital stats you need. Incorporate your LMS into existing systems by using API, SSO, and webhook features. You can easily integrate with your HR, CRM, sales, and marketing systems so that your data seamlessly flows from one platform to another automatically. This is particularly useful with tools like Salesforce, GotoWebinar, and more as you can synchronize your data and make your role more efficient. From admins to managers to instructors to learners, getting to grips with your LMS's user roles ensures your users have the appropriate level of access rights and privileges – as mapped to their needs. Having each one assigned correctly can save valuable time and effort for you and your organization. It allows each user to have a clear role, not get overwhelmed by unnecessary options and allows you to effectively delegate tasks. Everyone can simply focus on the task at hand and get it done quickly! Make sure your courses are performing at their best by continuously measuring, testing and optimizing. Test different media and course options and see how your learners react. And rely on their feedback and your reporting to see what impact each one had. You can even A/B test courses by offering half of your learners one type of content and another type of content to the other half. This can optimize your courses and ensure they are better than ever.